"To build high quality and energy efficient custom homes at a fair price, exclusively designed and crafted to fulfill the dreams, needs, and lifestyles of our discerning clients who seek to reside in the premier locations of Fairfax County, Virginia." 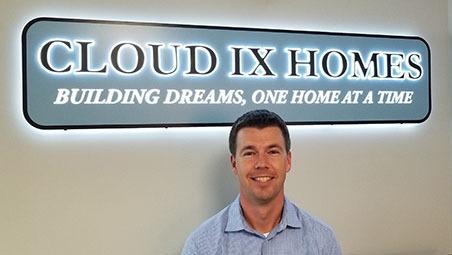 Cloud IX Homes' continued success hinges greatly on our ability to exceed our customer's expectations every step of the way. We know that delivering the area's finest high quality custom homes with unparalleled customer service and attention to the smallest details will continue to generate repeat business and heartfelt referrals. To consistently deliver the level of detail and quality required, Patrick has chosen to deliver only a handful of our luxury custom homes per year. This strategy allows us to keep our overheads low and provide to you the level of individual service you deserve when building a custom home. What's more, we are enabled to build your dream home at a market low price per finished square foot. We will only build aesthetically pleasing homes that are energy efficient and that maintain or improve the streetscapes of our beautiful hometown communities. If our mission speaks volumes to you, call us, and let us build your dream.